Unfortunately, the only GSM/3G modem that is currently offered by T-Mobile is the WebConnect USB stick (Huawei UMG181). 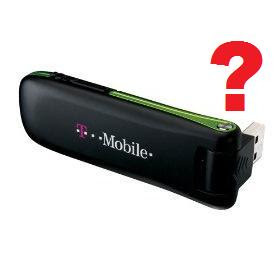 Like most mobile operators, T-Mobile assumes that you will be using the USB stick modem for internet access, not for sending and receiving SMS and MMS messages. As such, T-Mobile is blocking this device from accessing the “wap.voicestream.com” APN which is used for both WAP and MMS connectivity, and only allowing it to connect to the full internet access APNs with an appropriate data plan (with an inappropriate price). Even if you take a SIM card from an existing mobile phone device with MMS support and put it into the USB stick, T-Mobile blocks the device from connecting to “wap.voicestream.com”, which is a requirement for sending or receiving MMS message. As a result, it is not currently possible to use this modem to send or receive MMS messages on the T-Mobile USA network. This modem appears to do a decent job of sending and receiving SMS messages. However, there is no real speed benefit compared to a decent EDGE modem like the Option ICON 322. And the EDGE modems have the benefit of also being able to support sending and receiving MMS messages. For discussions of alternative GSM modems, see http://www.nowsms.com/tag/gsm-modem. Of course, a true 3G modem is desirable for sending and receiving MMS messages, because MMS messages are more bandwidth intensive. We are investigating the Option ICON 452 as a possible alternative for T-Mobile USA users, as for 3G it supports 850Mhz/1700Mhz/1900Mhz/2100Mhz. Based upon experience with other Option ICON modems, we expect that to be an excellent modem, as long as T-Mobile does not block it from the MMS Access Point! How are the investigations with the Option ICON 452. Does it work good with NowSMS and Tmobile ? Please let me know, as we are planning to migrate from ATT. The Option ICON 452 works well for SMS, however it exhibits the same problem for MMS with T-Mobile USA. T-Mobile USA seems to detect 3G modems and expects that they are being used for internet access. As such, they do not allow access to the wap.voicestream.com APN, which is required for being able to send/receive MMS. I tried the ICON 322 with a Tmbibile SIM. SMS is fine, but mobiles aren't receiving jpgs. They are getting http://TMobile:8080/MZ/…. I'm in the US. I'm trying to send to a verizon mobile/storm. When I try to connect to the link I get a http error 504:Gateway timeout. Is it Tmobile or the SIM card account? What about the Option GlobeTrotter Express 442. Do you think I will be able to send MMS Messages with it ? I am also testing the ICON 452 and you are right, I can not find a way to send MMS. But this is strange because I am able to connect to the wap.voicestream.com APN with the GlobTrotter Application. I will do some more research and let you know. I think that T-Mobile will not let a 3G modem send MMS. They assume the modem is being used for internet access. The best option for that network seems to be using an EDGE modem. I have used an ICON 322 and Huawei E160G … 3G modems that do not support T-Mobile's 1700Mhz 3G frequency … so they only connect on T-Mobile with EDGE … and they were able to send MMS. For these other modems, it might work if you disable 3G. The AT command AT+WS46=12 will do this. In NowSMS, under the [Modem – driver name] section header, add CommandPostInit1=AT+46=12 to have NowSMS send this command automatically at startup. Does this mean you have to have a T-Mobile data plan since you’re using the EDGE network? T-Mobile offers a pre-paid $15/month text only plan – and I was wondering if that plan would work with nowsms? For SMS (text messaging) that should work fine. MMS (picture messaging) does require some data access, so that is questionable. Data access policies for MMS vary with different mobile operators. Most operators have a separate (non-chargeable) APN (access point name) that is used for sending/receiving MMS, and do not necessarily require that the end user have a data plan to send/receive MMS. However, some mobile operators (including T-Mobile USA) use the same APN for MMS and other data, and may require a data plan in order to send/receive MMS. I was able to confirm that the t-mobile plan worked and my PC could send texts via a Motorolla RAZR V3, but I would like to use the Option ICON 322 USB – since the razr needs to be plugged in (charging) all the time for it to work. If I’ve done it with the RAZR should it still work with the ICON 322 USB? Text = Yes. MMS (Picture message) = ?. There is no problem with text messages (SMS). The T-Mobile specific issue discussed on this page is about picture messages (MMS).